Lisbon’s Parque das Nações district boasts yet another bold example of architecture. The IMOCOM building occupies a plot on the old Expo ‘98 site, adjacent to the city centre. The structure is an environmentally friendly project undertaken by a real estate company whose headquarters are located on one of the seven floors. The remainder of this commercial development is used as office space, while the ground floor contains retail outlets. Each corner incorporates a garden or water mirror, providing spectacular features for the offices. The construction, costing 40-million euros, includes a multimedia facade that displays audiovisual information to the public. The IMOCOM project utilises CCL flat-slab anchors (XF20) in each floor, and multistrand tendons (XM30, XM40, XM60) at the corners of the building. CCL post-tensioned slabs were used in the east side of the building on each floor to reduce the number of pillars required thereby, creating long, clear spans of uninterrupted space. The cantilever balconies were made possible by the use of CCL XM tendons in all corner beams. 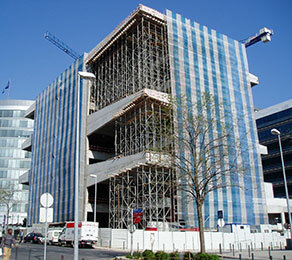 The CCL System was installed by Projecol SA, whose success in being awarded the contract was based on its longstanding reputation for specialist projects in Portugal. The use of CCL slabs allowed the designers creative freedom and gave them the opportunity to fully realise their design objectives. João Figueiredo of Projecol said, "I will always look for this kind of project in Portugal. I like these challenges very much, and the CCL system allows us to achive exactly what the architect requires".